Ti. 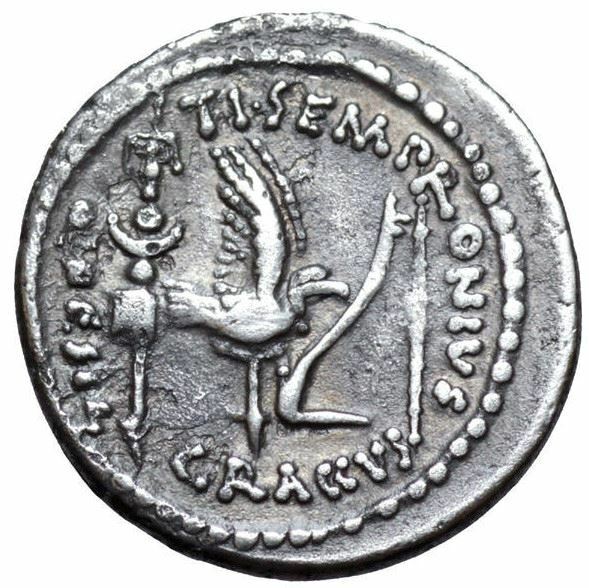 Sempronius Gracchus was one of the moneyers for the year 40 BC, as well as Quaestor Designatum. Gens Sempronia was a Roman family of great antiquity. It included both patrician and plebeian branches. The first of the Sempronii to obtain the consulship was Aulus Sempronius Atratinus, in 497 BC, the twelfth year of the Republic. The patrician Sempronii frequently obtained the highest offices of the state in the early centuries of the Republic, but they were eclipsed by the plebeian families of the gens at the end of the fourth century BC. The glory of the Sempronia gens is confined to the Republican period. Very few persons of this name, and none of them of any importance, are mentioned under the Empire. The most illustrious family of the Sempronii bore the cognomen Gracchus. This family furnished the Republic with two distinguished generals, as well as the brothers Tiberius and Gaius Sempronius Gracchus, commonly known as the Gracchi, who fell as martyrs to the cause of the plebeians, while attempting to implement vital land reform legislation. The family afterward fell into obscurity, but still existed in imperial times.